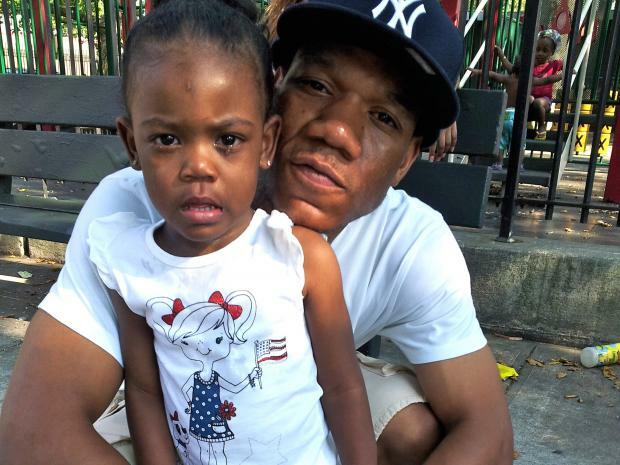 BROWNSVILLE — A 2-year-old girl was among six victims wounded in a drive-by shooting in Brownsville Sunday, the third time this month a young child has been the victim of gun violence in the city, police said. The shooting also left two teenage boys and three men, including the toddler's father, hurt. The shooter was riding in a white sedan shortly before 7 p.m. at Riverdale Avenue and Chester Street, the NYPD said. Ariyanna Prince, 2, was shot in the left knee while her father, Michael Prince, 25, was struck in the buttocks, police said. The older Prince called Ariyanna's mother, Jahlessa Westry, from the scene of the shooting. "I never thought it would be mine, until your phone rings and they tell you your daughter got shot," Westry told NY1. On Monday, Westry said she spent nearly 19 hours at Brookdale Hospital before heading home for half an hour on Monday to grab a change of clothes and a few things for Ariyanna. "I'm about to go right back but she wants her stuffed animals, especially Minnie Mouse," Westry said. "I just hope she can be her normal self and run and play again." Ariyanna and Prince "were just at the wrong place at the wrong time," the girl's grandmother, Leteria Hinton, 44, told DNAinfo.com New York. "My son said he didn't realize that they were shot until somebody told him, 'Your daughter is bleeding, and you are shot, too.'" Kentrell Simpson, 13, was shot in the hand, and Andrew Void, 17, was shot in the leg, cops said. Craig White, 23, and Kenneth Thomas, 27, were also shot in the leg. Four of the victims were taken to Brookdale Hospital, and two were transported to Kings County Hospital, police said. All were in stable condition and were expected to survive. Doctors at Brookdale Hospital were waiting to perform surgery on Ariyanna, who was suffering from a fever Monday morning, Hinton said. Still, the toddler was conscious and talking to both her grandmothers. "Good morning, Grandma!" the toddler told maternal grandmother Deloris Lawson, 44, in a 7 a.m. phone call. "I knew she felt better. "She's scared of the pain," Lawson added. "She can wiggle her toes but she won't move her legs because of the pain." At a news conference Monday morning, City Councilman Charles Barron called for an end to the NYPD's stop-and-frisk policy and a commitment from the city to invest $200 million in youth centers in poor neighborhoods. No one has been arrested. 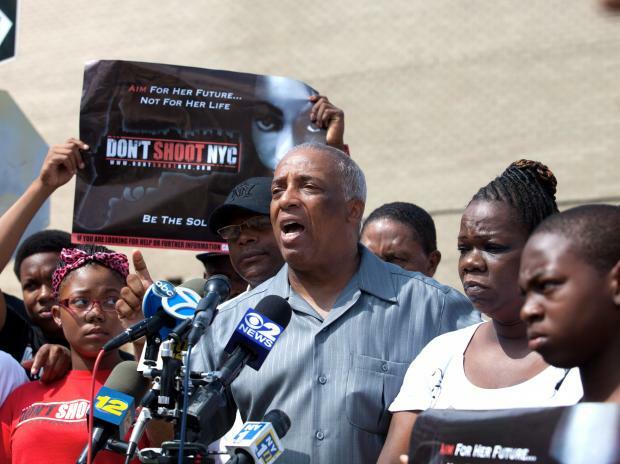 The NYPD is offering $12,000 for information leading to the arrest of the shooter or shooters. Witnesses told cops that a Nissan Altima with Florida license plates fled west on Riverdale Avenue after the gunfire, according to the New York Daily News and New York Post. 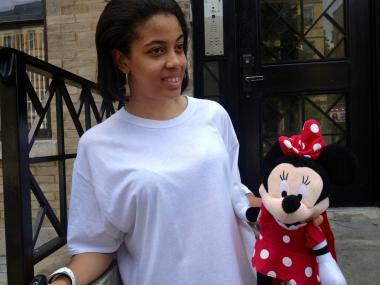 Jahlessa Westry, mother of Ariyanna Prince, went home Monday to grab her daughter's Minnie Mouse doll. Police said they have not yet confirmed the car's make or model. Cops believe the target of the shooting was Void, a teenager who allegedly has gang ties, a police source said. He is believed to be a member of the Hoodstars — or Hoodstarz — gang, which was involved in a violent turf war with a rival Brownsville gang last year, Brooklyn District Attorney's Office said. In January, 43 alleged Hoodstars and Wave Gang members were indicted on charges including murder, assault, conspiracy and weapons possession after they bragged about fights and shootings on Twitter, Facebook and YouTube. Ariyanna was the third young child hit by gunfire in the last three weeks. Isaiah Rivera, 3, was shot in the legs while playing at a Bedford-Stuyvesant playground July 8. He survived and was home two days later. Two men were arrested in the shooting. Lloyd Morgan, 4, was struck in the head by a stray bullet and killed when a shootout erupted at a memorial basketball game in The Bronx last Sunday. Three people have been arrested. "You got the 4-year-old kid, another 3-year-old, and now a 2-year-old," Hinton said. "So many innocent lives have been hurt. Things just got out of control now." Lloyd's funeral is scheduled for Wednesday at the Mount Neboh Baptist Church in Harlem, where Rev. Al Sharpton will deliver the eulogy.